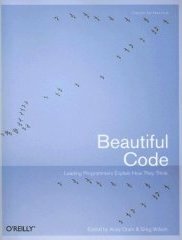 Second, instead of an in-depth examination of a single topic, it’s a browsable anthology of essays by a wide range of writers about a wide range of topics, loosely tied together by a single theme: Beautiful Code. Here beauty is widely interpreted, with each author applying the adjective as they see fit. Some essays work better than others, of course. Andrew Kuchling’s piece about how to implement Python dictionaries so that they perform well for all of their varied tasks was very interesting, reviewing all the various optimizations and tradeoffs. Not to turn this into a Python vs. Ruby thing, but Yukihiro Matsumoto’s piece, Treating Code as an Essay, was fluffy and inconsequential. That’s the price you pay for having an assortment of pieces by different authors. begins Arun Mehta’s When a Button is All That Connects You to the World. One of the fascinating aspects of these essays is that although they are all about code, they come from such diverse domains, that you can’t help but learn new views on topics you already know a lot about. I haven’t read all of the pieces in the book, but the ones I’ve dipped into have been thought provoking. It’s an interesting collection of essays, each by someone who cares a great deal about their code. If you care about yours, Beautiful Code can only deepen your appreciation of it.